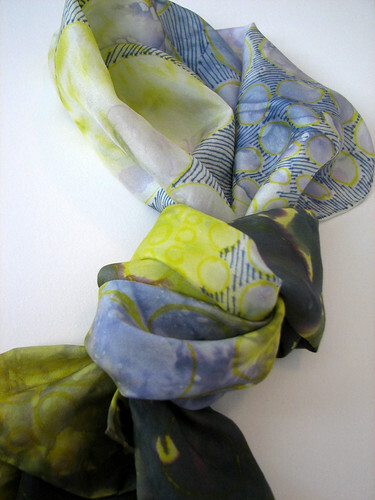 This daylong workshop will explore easy and artful ways to apply dye to silk scarves. From simple techniques such as tie-dyeing, resist and salt, to interesting mark-making techniques, we will modernize this ancient art form. We will look at examples of mid-century textile designers and we’ll also be inspired by the wonderful art and nature surrounding us at Lynden. 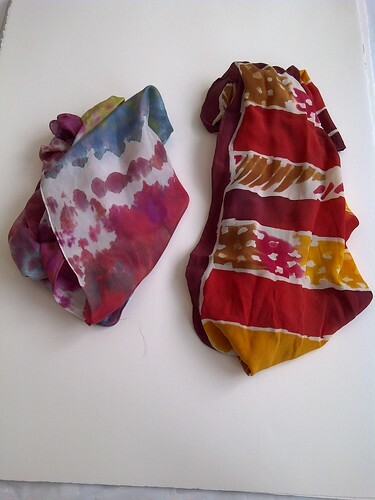 Each student will create three wearable and uniquely painted scarves. No experience required, and all materials supplied. Remember: using dyes can be messy. We'll supply you with an apron, but please wear clothes that you don't mind getting stained. Bring a bag lunch and beverages and dress for the outdoors (footwear, sunscreen)—we’ll be making use of Lynden’s 40 beautiful acres during our breaks. Kelly Lahl is a multi-faceted print and surface designer working from her studio in Milwaukee, WI. She has recently taken to putting pigment down on silk, and has been experimenting with alternative approaches to surface design. She's a colorist and draws inspiration from the likes of Vera Neumann and various mid-century modernist designers and painters. She has a deep love of printing types and lettering, so naturally enjoys teaching undergraduate typography classes in the graphic design program at the University of Wisconsin-Milwaukee.